Now that my connections is working. I woke yesterday to no cable—which--well happens. The good news is: my telephone, cable and electric lines are under ground—and with the wind storms and downed trees last fall, I didn't have to worry about service. The bad new is: we had a thaw this past weekend, and milder weather melted away a good percentage of the snow and ice—and all that salty, slushy water had to go somewhere. Some it went down the manholes and into the electric service tunnels. This results in small (and large) electrical fires—and sevrice disuptions, all round the city. The small shorts and fires and the problems they cause don't make the news. Service was out till 3 PM yesterday and intermintant for hours after that. This morning is seems to be working again. Meanwhile, I am back to the socks. I like the way this yarn is pooling. And I have been thinking about how a heel is going to change that. So what kind of heel then? Well with some thought, I am going to do a reverse engineered Flap/Turned/Gusseted heel. 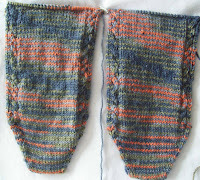 There are two way to do this-- I am doing the simple way—in an another inch or so, I will start to knit a flap (in stocking knit) on the sole. Then I'll do a turning, pick up stitches for the gussets, and work the gussets (and back of heel) in heel stitch. It will change the pooling—but I don't think it will matter much. Hi Helen, I have a question for you, my dear knitting expert! 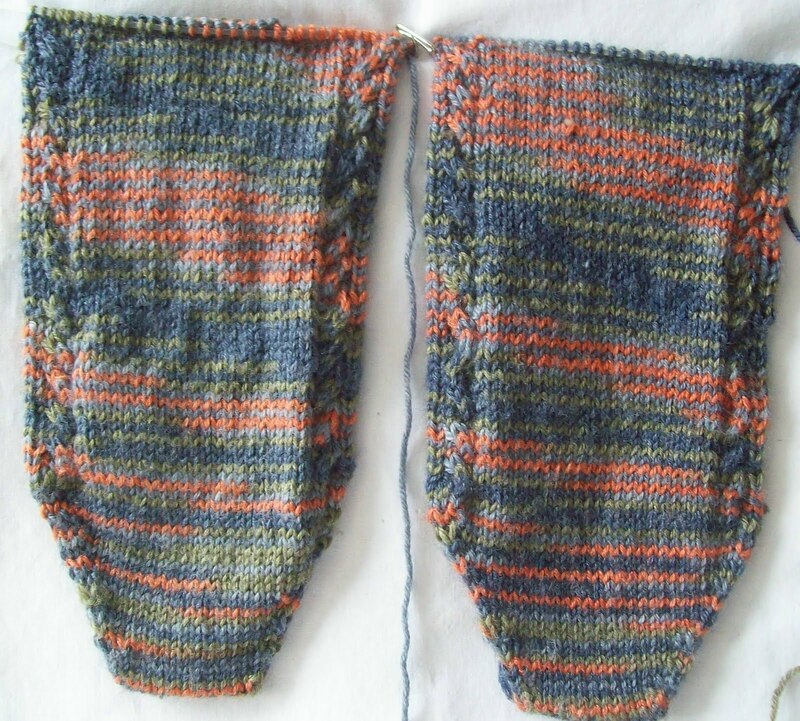 I have a friend knitting toe up socks and she has noticed that many patterns suffer from a the problem that, after turning the heel, the process of making the reverse kind of gusset results in tightness at the top of the foot over the arch (does that make sense?). She has figured out how to read patterns ahead of time to see if they accommodate this issue, but I wonder if you have a quick fix if your pattern doesn't acknowledge this issue with toe-ups.